I have sought out Amy Facca again who is a historic preservation planner, architectural historian, and grant writer with a strong interest in economic development. In Oct. 2013 she wrote an informative piece about various emerging facade improvement programs that benefit communities. 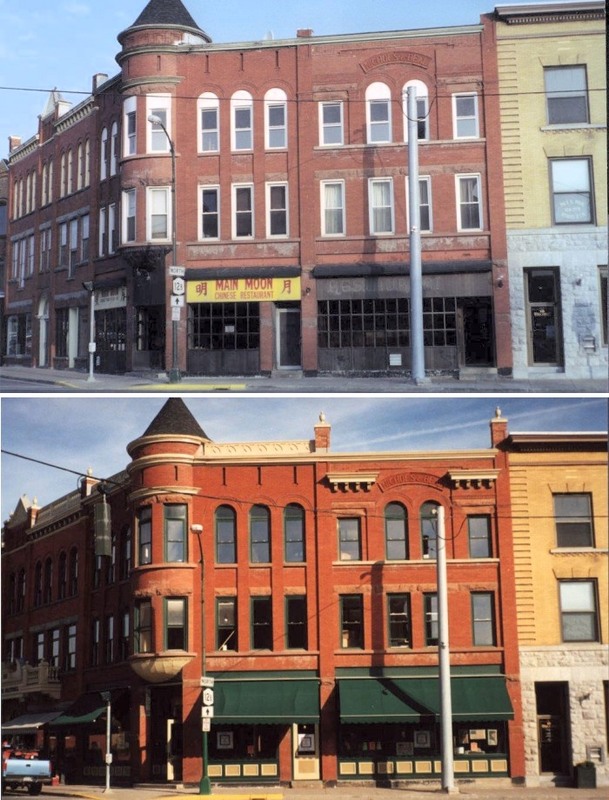 These are incentive programs created to encourage the restoration of the exterior appearance of buildings and storefronts. Improvements like masonry repairs & pointing; facade painting, repair, reconstruction or replacement of historic features; awnings, signage and exterior lighting, gutters, and downspouts; window & door repair or replacement. 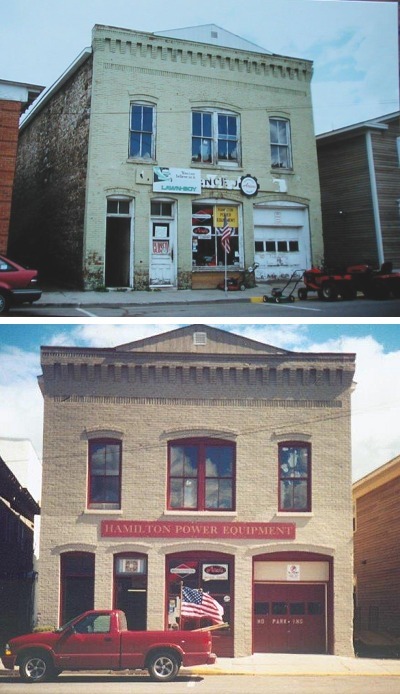 Her photos in this article are of Hamilton NY facades before and after to illustrate what can be done. 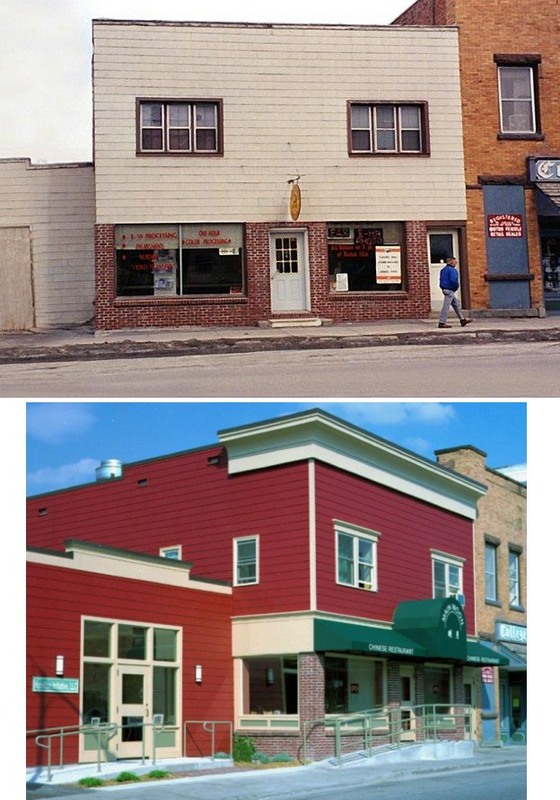 This pair of commercial buildings were updated with a new color, including a new cornice, siding, windows, doors, awning and detailing. Improvements in the building below included replacing unsightly signage, a new paint scheme highlighting the building’s historic character, a new cornice for the roof gable. The dark paint was used to make non-historic building elements (the garage door) less obvious. We would look to federal and state grants for community and economic development, housing, and downtown revitalization; and municipal revenue. The key question is– Is this possible with our current leadership? These programs are usually developed and managed by the municipality’s planning, community development, economic development office, a Main Street organization, those interested in civic improvements. Obviously, this calls for coordination and cooperation. 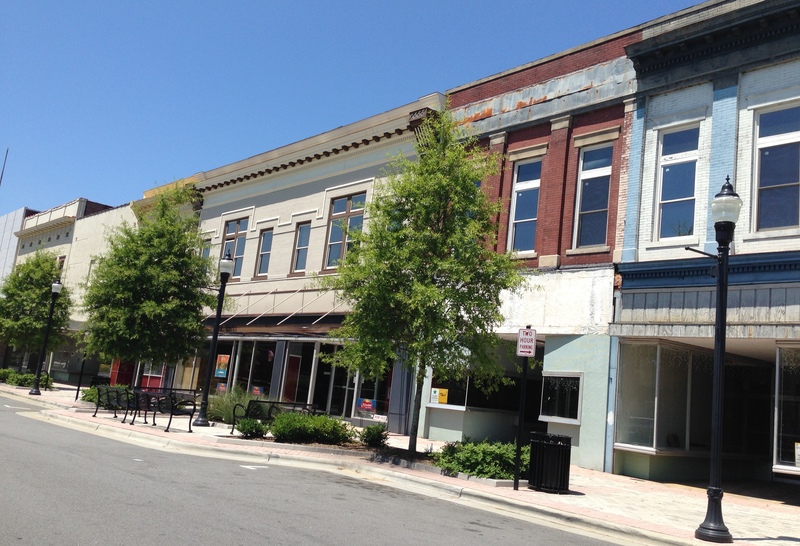 Here is our Main Street Rocky Mount – Use your imagination and apply the ‘before and after’ treatment to our wonderful commercial buildings, one building at a time. This entry was posted in Preservation of Historic Commercial Buildings and tagged Amy Facca-historic preservation planner, Hamilton NY Facade Program, Main Street Rocky Mount, Preservation. Bookmark the permalink. Great post, lets hope the powers that be will take this into consideration! Keep pointing these positive developments out that you see. We don’t have to reinvent the wheel – just copy another successful municipality. They are all over the place.